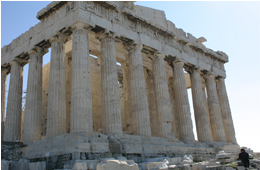 The Greeks were the first culture to think scientifically and not just rely on myths to explain occurrences. This began during the time of Thales about 600 B.C. Thales believed that all matter was derived from water, which could evaporate into the air or dissolve into the earth. His successors expanded on this theory and came up with the idea of the four elements that composed the earth: earth, water, air, and fire. With this scientific break through, others like Democritus thought these elements were composed of atoms with minute particles moving in a vacuum. Aristotle believed that the elements formed a continuum of mass and therefore a vacuum could not exist. Slowly, the atomic idea was lost by the Greeks, but it was revived in the Renaissance once again. Today, the modern pharmacist deals with more complex pharmaceutical remedies than the elixirs, spirits, and powders described in the Pharmacopoeia of London (1618) and the Pharmacopoeia of Paris (1639). Today, all major medicines which are considered having the greatest therapeutic value have to be passed by the Pharmacopoeia of the United States. The Pharmacopoeia of the United States was first published in 1820 by a Committee on Revision. This Committee was represented by all colleges of medicine, all colleges of pharmacy, all state medical associations, all state pharmaceutical associations and the surgeon general. After the drugs are chosen, the standards for quality and potency are formulated by the pharmacists and pharmaceutical chemists. Other drugs that are considered to have less therapeutic value are analyzed by the National Formulary. These less therapeutic value drugs are then published by the American pharmaceutical Association which was founded in 1852. They have been published since 1888. If their is any significant variation from the pharmacopoeia and formulary standards, the violator may be prosecuted by the Food and Drug Administration under the Pure Food, Drug and Cosmetic Acts. The word “Pharmacy” began to develop as a profession separate from medicine in the early 18th century. In 1821, the first U.S. school of pharmacy was established in Philadelphia. Since then, the community pharmacist, or druggist, is increasingly called upon to give advice in matters of health and hygiene. The advise they are now called on to give to their patients and doctors are drug action, the use of drugs in treating certain diseases and drug-induced side effects.